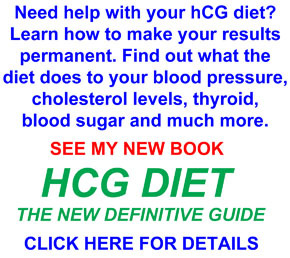 Fluid retention is a common problem during the hCG diet plan. It is a common problem in general, and it has nothing to do with drinking too much water. Here is what you should know. Fluid retention is a regulatory function of your body. If you eat too much or drink too little, your body will retain fluid — men AND women. It will sometimes show up first as swelling around the ankles, especially if you sit down all day. It will also lead to ‘false’ weight gain — i.e., not fat gain, just excess fluid. Here is what Dr. Simeons recommended about water intake, which holds true even if you are not on his protocol. By the way, if you are taking in natural diuretics (coffee, tea, alcohol), then you have even more need for drinking additional water to make up for dehydration and strain on your kidneys.